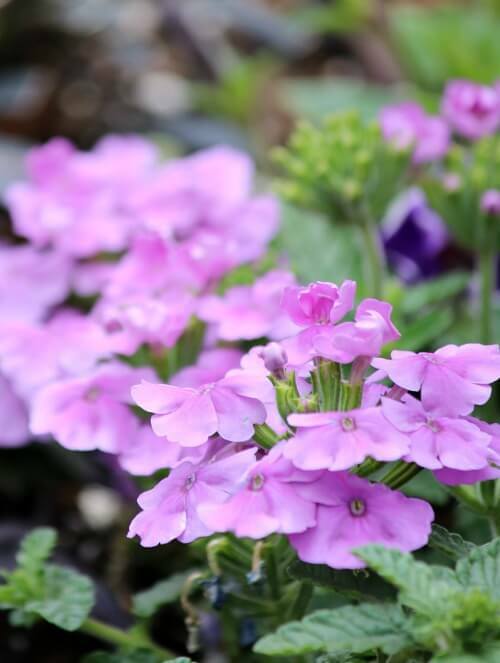 In this post I’m showing various shades of purple flowers on my patio. From light lavender to deep purple. Red-dominated shades of purple add a bit of drama to the garden. Purple’s ideal partner is yellow, and you see me use a lot of these two colors together. Last year it was my two primary flower colors on the patio. Yellow lightens the landscape, while purple subdues yellow. The relationship of contrasts is even more important in shade-dappled gardens. 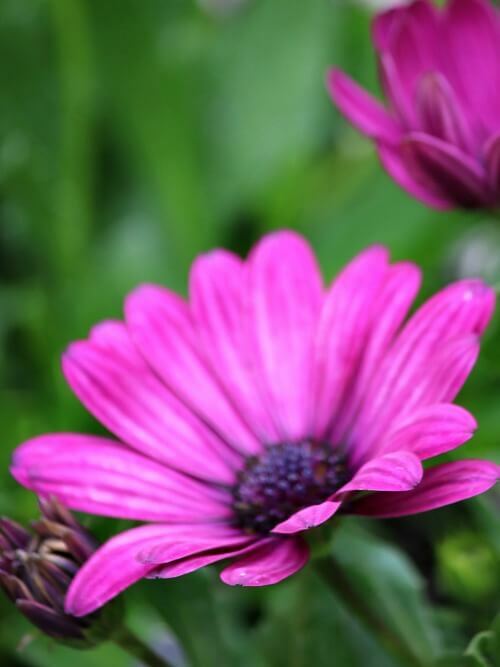 Purple kind of gets lost in the shade, so pair it with a light-colored companion to highlight it and make it more noticeable. 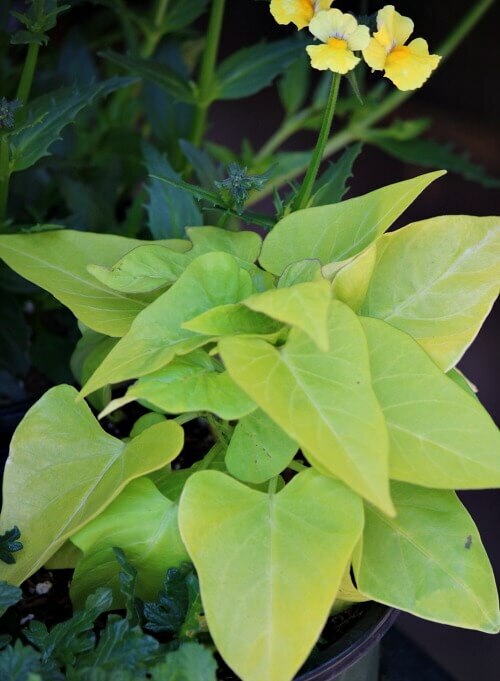 Chartreuse plants, as in the potato vine, make great partners with purple flowers. There is just something deeply gratifying about seeing these colors used together. Yesterday morning I decided to go by the nursery while I was out running errands. Famous last words to myself as I parked: I’ll just get a few plants. Where they get me is the buy 12 or more plants for $3.99 instead of $4.99 each. So naturally I had to get a dozen to get that discount. 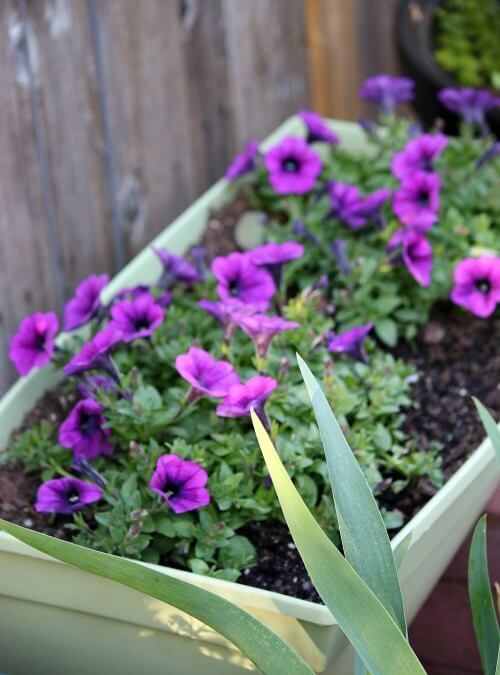 I took these purple petunias out of the above container and put them in the galvanized containers. I needed a bit more color there. Digging the purple petunias out of the container I encountered a gazillion red ants. I shook cinnamon all over the soil. Ants hate cinnamon. Funny, I love it. I went out later and looked and there was nary an ant in that container. Where they went I do not care. Just out of my pots. It doesn’t kill them, but they will leave. I’ve written up this tip here before: If you have ants coming indoors, shake a solid line of cinnamon across where they’re coming in. They will leave. The line of cinnamon should not be broken or they can go through the gap. Make it a solid line. I picked up lemon verbena that they did not have in stock last time. Charlie will chew the leaves like he does the pineapple sage. But if that soothes his tummy, that’s okay. I’m headed outside to the patio to dig in the dirt. While we still have cooler spring weather it is especially enjoyable. When it’s the height of summer, not so much. ohmygoodness. your tips are wonderful. Your garden is looking so pretty! I have used cinnamon for ants after you shared that tip before and it works like a charm!! 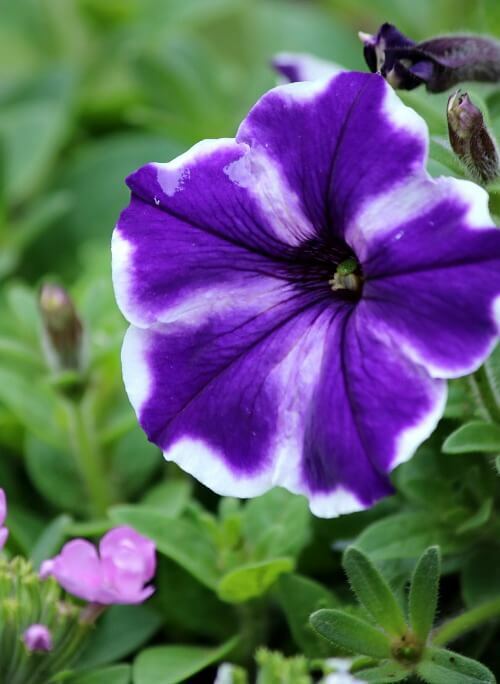 I must look for the splotchy purple petunias, they are new to me, love them. Thanks for sharing. Love your flowers,your garden, and the tips. I haven’t seen those spotty petunias yet, but will be looking for them. 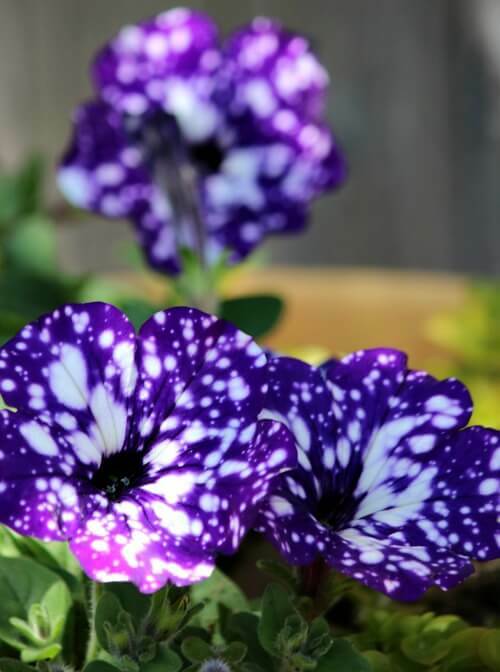 Where did you find galaxy petunias? love this post My house is baby blue The front garden would benefit using this color scheme..thank you………..
Purple and yellow are two of my favorite color combos. I have alot of it blooming in my spring garden right now. 🙂 I have to go for the bargains as well. I am hosting a garden link party with four other gals. Would love for you to link up this post. I use lots of purple, pink and white in my back yard with a purple/yellow combination thrown in because the combination is so pretty. I use more yellow in the front yard though. The Stella d’Oro blooms most of the summer so I am trying to add a few a time by the rock borders. My new neighbors had their trees pruned last week and now I have more sun again. I had one of their tree limbs removed earlier this year because it was brushing up against my new roof (they were ok with that by the way) so I knew they were eventually going to have the trees trimmed. They have 4 oak trees and now the trees look wonderful and I don’t have limbs hitting the top of my car as I pull into the driveway anymore. These are youngsters that just moved in and they are so nice. They have indoor cats and dogs. They removed a crepe myrtle that was too close to their house and the yard looks good. All the grass should grow back now that there is some sun. They are anxious to get started with some flowers too. It’s nice to have some youngsters next door that are looking forward to gardening.